As I head into the new year my biggest priority is, balance. My perspectives on life have shifted and I’m finding new passions, different motivations, as well as cultivating new and meaningful relationships. With all of that comes the difficulty in managing my time and stress. I have a lot on my plate that I love, but it can be difficult at times. First and foremost. When am I going to train? When am I going to cook? When am I going to coach? When will I spend time with my family? For me, having a loose flexible schedule is key to balancing all that I need to get done, and then holding myself accountable to that schedule. I bought my first big paper calendar this year (sounds silly I know.) Sitting down every Sunday, mapping out my week, making notes of all the things I need to get done and being able to see my calendar on paper everyday has helped me so much in terms of managing my time. When it’s time to cook and eat, focus solely on cooking and eating. When it’s time to train, focus solely on training. When I have time to spend time with my family, they get my undivided attention. This means shutting the phone off, and being engaged. Im not perfect, I still have days where I check my phone in-between sets, or respond to an email when I’m cooking some food. I have found the more that I can keep myself in the moment and focus all my attention on what I’m doing, not only am I more productive, but I feel better and the quality of my actions is at its highest. This takes a lot of practice and awareness! With a busy life schedule it can be easy to forget about your individual wellness and needs. As much as I prioritize all of the things I need to get done on a weekly basis, I also make sure to carve out some me time. If you don’t take care of yourself, managing all other responsibilities is going to be daunting. Practicing these things has been vital to my balance. We only have 24 hours in a day and I’m not perfect in getting all these things done, but it’s all about progress, not perfection. I am extremely excited for 2018. Life seems to get sweeter every year and I feel so fortunate to be where I am. Express gratitude daily, love yourself, love others. In 2017 I was training harder than I ever had, eating the best I have in my lifetime and was surrounded by a core group of friends that are incredible to say the least. I enter 2018 training less, trying to improve my overall relationship with food and still, thankfully, surrounded by those incredible friends. I also charge forward with new direction and focus on where I want to go in this new year. Last year I was training and eating like I was because I didn’t want to feel left out, it was convenient, I had people tell me I should and (most days) it was fun. Not because that was my goal, and that’s exactly why it didn’t last. I wasn’t pulled towards these things by passion. Folks would ask me if I was training for regionals or some grand finish line. Nope. I’ve heard athletes speak of regionals or the games being their goal but that never stirred up anything within me. Those goals sound stinkin’ cool but that’s not enough to pull me out of bed at 5am to train or say no to ice cream at a party. 2018 isn’t about FOLLOWING a dream or idea anymore but rather being PULLED so strongly towards my passion that nothing can tempt me away from it, get in the way of it, or divert my drive towards it. This year I have an idea of where I want to go and I can start setting a plan or roadmap to get me there. Happy New Year Iron Athletes! EVEN if you lived under a rock…some way…somehow…you have inevitably been exposed to some kind of advertisement talking about new year resolutions. So what do you do when you are inundated with this idea that you have to change everything about yourself? Nothing was ever accomplished without planning and preparedness. You are going to take 20 minutes and write down EVERYTHING you think will make you a better person (for your eyes only). Then each week, you will pick JUST ONE thing to implement into your normal routine. Once it becomes habit and not feeling like “extra” effort (hopefully in 1-2 weeks) then we go back to our list and add in something else in addition to the great new habit you have completed! People are made up of what they practice every day. It is easy to focus on the outcome, but the process is what gets you there so you need to bring clear intent to the work you do each day and that is easy when our goals become a priority in our life. Try ranking your brainstorm list or pull out what seem to be the most important things to you right now and that will make it easier to be consistent with your weekly task of one new thing to add to your schedule. If you don’t care about what you are doing, then it will show in the work. Before anyone else believes you can do it, you have to believe you can. Lots of times, I have frustrations about how I look and fears about how capable I can be at CrossFit, but all of that is based on other’s perceptions or future experiences that haven’t happened yet. I shut myself down before I even have a chance to feel good and that is how we fall from what’s really important to us. Fear of failure. Do not fall victim to false perceptions. Love yourself in order to build resiliency to the pangs of life and keep good people around you that affirm the things you value in your own life! Stay Tuned for next week when Coach Ashley Shares her thoughts on Resolutions! What an amazing week of testing! The bell literally broke three times in one day because of all your fantastic 1 Rep Max Efforts! At the same time, some of us struggled. Our legs weren’t under us or shoulders didn’t have it that day. The important thing to remember is it was one day. One opportunity to meet a challenge and come through the other side of it a stronger person. Maybe you were stronger physically this go around or maybe you had an entirely different battle. One that left you short of your goal. That’s only true however if your only takeaway from testing is the number. You’d be wrong though if you thought the answer to that question lies solely in the score you got that day. Don’t get me wrong. If you got a bigger 1 rep max or a faster score, then there is definite improvement and you should be proud! But, has every day felt like that? Has every workout been a win? My point is, if you are not also considering what has also changed throughout your life with work, relationships, sleep, food, training schedule, new pets, whatever, then we are limiting our scope of success. Before you set up for a workout or even before you come into the gym, realize that we are a product of ALL the choices we make and whether they have been good or bad, they have gotten us this far. That’s your reality so embrace it and find a way to make the most out of your next 24 hours. If we spend time complaining about our situation or getting frustrated at our performance, then we focus our time and attention on the negative. Instead, spend your time being thankful for what has brought you here. Set up excited that you get to use your body and fight to make it stronger. If you hit that moment in the workout where you feel like your failing, then be happy. You have reached a new threshold and your new task is to be better than you thought possible. Greatness is reserved for people that seek challenges in life. (1) After watching the video, did you see how every one of the lifters (for the most part) keeps their grip narrow, upper back really tight and chest up. They let their knees break first and travel over their toes and really drive with their quads. As they come out of the hole (bottom of the squat) they come out with speed and drive their upper back into the bar. This keeps the torso upright and maximizes efficiency. (2) See how they attack the weights. Each rep looks like a max effort. Because it is. They take their time between reps, get their breathing right and focus on making each attempt technically perfect. This is the approach we all need to have. Getting stronger is hard, and requires you to constantly push weight. Don’t be afraid to fail a rep, and push yourself. You can handle more than you think. At 2:21 you will she that girl squatting, and as she drives out of the hole her hips rise immediately, shifting the weight into her hamstrings, glutes and back, eliminating the use of the quads. Not ideal, and technically not great. She isn’t quite able to keep her torso upright with that load and she ends up failing the last rep.
As you progress in the sport, PR’s will be fewer and farther between. Focus on your technique and maximize your efficiency. Every rep, from your air squat warm ups to your max out 1 reps should look the same. Constant attention to the details, and dedication to maximizing your technique will allow the PR’s to continue to roll in. CrossFit Endurance Instructor Chris Hinshaw is an amazing Triathlete turned CrossFitter after experiencing how greatly it’s training principles improved his health. 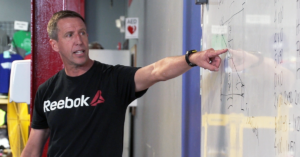 Now, he turns his incredible knowledge of triathalon and endurance training on CrossFit’s best athletes and proves that you can structure aerobic workouts that will not weaken your other skills, but rather strengthens each component drastically! Here is a fantastic podcast interview with Chris Hinshaw explaining the science and detail of this method in greater depth, produced by Barbell Shurgged. You can also check out his website aerobiccapacity.com to see 4 weekly workouts posted with these goals in mind! 1. 2 Days a week along with regular CF Training is what it takes! 2. You develop an amazing awareness for intensity at bodyweight when you run building a precise understanding of your capacity. 3. We want to use running to increase the relationship between our anaerobic and aerobic capacity (400 meter time versus mile time) and this should be done while remembering that younger athletes (under 40) will benefit from an endurance training program whereas older athletes (over 40) benefit from speed training. Friday Night Frights Events Announced! *Athletes cannot drop the weight between the two movements. 3-minute AMRAP of Sumo Deadlift High Pulls at 95/65 immediately followed by a 1-minute AMRAP of 15′ Rope Climbs. Every Rope Climb completed awards the athlete an additional 20 seconds to complete an AMRAP of Thrusters at 95/65. 50 Handstand Push-ups for time; every time you break from the wall, do 5 pistols. 6-minute cap. 6-minute cap to find your 3 Rep Max Power Clean. *Athletes can drop the weight between repetitions, but only have 5 seconds to have moved the bar from the ground starting their next repetition. Judge will count them down. 75 Hanging Knee Raises for time; every time you break from the bar, do 10 burpees. 6-minute cap. Rx Division – Workout 1 is a chipper for time – 12 minute cap! Other than the deadlift, each partner will complete ALL 30 repetitions before there partner can start their 30 repetitions. Once both partners complete 30 reps EACH, then they can move to the next station! The workout is for time with a 12 minute cap. Standards reviewed prior to the event at 6:30! Rx Division – Workout 2 has 2 parts. Part 1 is FRAN for time – 5 minute cap! Only one person works at a time while they work to complete all 90 reps. Each person must do at least 1 repetition. 2 minutes prior to the start of this workout – part 2 will be announced that starts at the 5 minute cap mark, even if all the athletes haven’t finished all 90 reps. Everyone stops and starts the second workout which will be a couplet involving the loaded barbells (95/65) and a gymnastics movement for another 21 – 15 – 9! If you can handle Fran, you can handle this workout. Rx Division – Floater – Sign ups available first come first serve at the event. The floater will be posted on the sign up board! Scaled Division – Workout 1 is a chipper for time – 12 minute cap! Other than the deadlift, each partner will complete ALL repetitions before the other partner can start their repetitions. Once both partners complete the listed reps EACH, then they can move to the next station! The workout is for time with a 12 minute cap. Standards reviewed prior to the event at 6:30! Scaled Division – Workout 2 is a couplet for time – 5 minute cap! 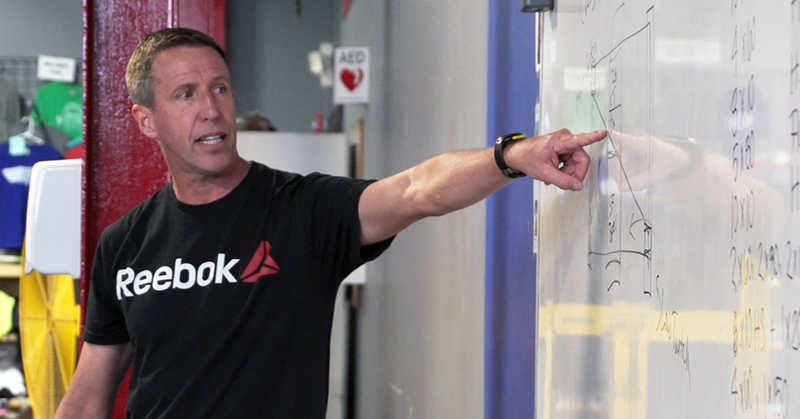 2 minutes prior to the start of this workout, part 2 will be announced that starts at the 5 minute cap mark, even if all the athletes haven’t finished all 90 reps. Everyone stops and starts the second workout which will be a couplet with a weight and a gymnastics movement for another 21 – 15 – 9! If you can handle the first workout, you can handle this workout. Scaled Division – Floater – Sign ups available first come first serve at the event. The floater will be posted on the sign up board! PREVENTION: Shave calluses, Work Grip Strength, and monitor wear and tear. Using a ped egg, razor, file, cheese grater or whatever to file down those calluses removing excess skin that easily loosens and pulls the rest of your hands apart during the workouts. That being said, your skin gets pulled by the sliding of your hand on the bars. Working on grip strength and having a better hold of bars, will reduce the amount of excess rubbing…especially, false gripping those Muscle Ups! Finally, use straps during lifts or GHDs instead of Toes To bar so that you balance the amount of gripping you actually do day to day saving our hands for more workouts. POST TEAR CARE: Keep them Clean, Use ointments, and tape up. First and foremost, clean them. Bite your bottom lip and clean them right away and then bandage them up with some ointments: Neosporin or Aquafor (if its a surface tear or like a popped blister). If it is a deeper bleeding tear, then don’t cut the skin away, but just wash and wrap and modify those workouts to give your hand time. For those surface tears, here is a great video on how to tape up! Buy Grips?! So if taping and tearing become an often occurence, you may want to look at different grips, gloves or gymnastic straps to help your way through CrossFit. 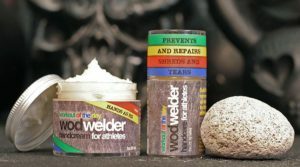 This is a common need for the avid CrossFitter and wraps can be used as preventative or post tear care! Here is a popular option for straps and wraps! And for those of you looking for the full package of hand care products, there are also options like the WOD Welder Handcare Kit from Rogue Fitness! * SCORE is time it takes to complete workout. – Athletes must start behind the line. Race to get the KB and start the run. Every time they return from the run, they need to find a marked “X” to place the KB down on before starting there 50 repetitions of any of the three movements. – Men will use the 53# Kettlebell and women will use the 35# Kettlebell at every stage of the event. – Kettlebells can be put down. There is no expectation for KB’s to be unbroken, but it will happen cause you are rad. – Swings: KB must pass between hips and then get a full lockout of elbows overhead. Judge needs to visibly see ears pass through arms during overhead lockout. Hips/Knees locked out as well. – Burpees: Face the KB. Chest to Ground, Jump over KB with BOTH FEET. – OH Lunges: Lunge with KB in one hand at a time during lunge as well as having it held overhead. Arm doesn’t need lockout, but can’t gain support from any other part of the body, unless resting between lunges. SCORE is total repetitions at the end of the workout. * Deadlifts: Full lockout at the top with knees extended, hips open and shoulders behind the bar when standing. * Pull-ups: Elbow locked out at bottom of the pull-up and chin over the bar at the top. * Chest to Bar Pull-up: Elbow locked out at bottom of the pull-up and Chest makes contact with the bar below the collar bone. * Bar Muscle-up: Elbow locked out at bottom of the muscle up and elbow locked out at the top of the muscle up. Feet can’t rise higher than bar during kip. * Not being able to perform a lift or gymnastic movement, doesn’t disqualify you. Everyone rotates forward in 15 second transition whether they completed any reps or not. FLOATER: Skill Tests! Announced at Friday Night Lights!! – Athletes must start behind the line and at 3-2-1-go, take off on their run. Every time they return from the run, they need to find their designated weights in the rack, unrack it, move to their marked “X” on the floor and then begin their movement. At end of 50 repetitions, they must return the weight to the same rack and begin their next run. – Men will use the 45# bumper plate and women will use the 25# bumper plate. – Plates can be put down. There is no expectation to do 50 reps unbroken, but it will happen cause you are rad. – Ground to Overhead: Holding the plate with both hands, athlete, must touch plate to the ground, then extend it overhead with elbows locked out. Judge needs to visibly see ears pass through arms during overhead lockout. Hips/Knees locked out as well. – Burpees: Face the plate. Chest to Ground, Jump onto the plate with BOTH FEET. – OH Lunges: Lunge with both hands holding plate overhead during lunge. Arm doesn’t need lockout, but athlete can’t gain support for weight from any other part of the body, unless resting between lunges. *SCORE is total repetitions at the end of the workout. * Push-ups: Start at top of push-up with Elbows locked out. Chest touches ground without thighs touching and returns to full lockout at the top. * Elevated push-up: Feet on a plate and then the same standards as push-up listed above. * Ring Push-up: Biceps to the rings at the bottom of push-up, then lockout elbow at the top.